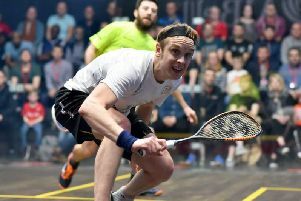 Former world No 1 Willstrop recovered from a game down to defeat Simpson, extending his winning-streak over the 29-year-old to five matche, producing a masterclass in the next three games – even failing to drop a single point in the fourth game to close out a 7-11, 11-2, 11-4, 11-0 triumph. Nick Matthew battles against wildcard entrant Abdulla Mohd Al Tamimi in the first round of the Qatar Cklassic. Picture courtesy of squashpics.com/PSA. Willstrop will now face German No 1 Simon Rösner in the second round. “You’ve just got to ignore the scoreboard a bit really, otherwise you get carried away with being behind and that becomes a negative thing. I just kept telling myself that it didn’t really matter and what did matter was how well I was playing squash. The Yorkshireman will be joined in the second round by Matthew, but only after the 2009 winner of the event was given an almighty scare by tournament wildcard Abdulla Mohd Al Tamimi. Three-time world champion Matthew came within two points of falling to a shock defeat at the Khalifa International Tennis and Squash Complex in Doha. Matthew, 36, was cruising after taking the next two games but was powerless to prevent the Qatari No 1 - buoyed by vocal home support – draw level before going 8-4 up in the decider to threaten a huge upset. Matthew, however, drew on his years of experience to wrestle back momentum, taking seven of the next eight points on offer to seal an 11-9, 11-8, 9-11, 10-12, 11-9 victory. “Physically I felt great, but he is such a clever player and anything I played short he was able to counterattack me beautifully,” said a relieved Matthew. “I’m not sure how I won that to be honest. I think today he deserved to win. When we had that ridiculous rally where we both ran like headless chickens, and he ended up playing that incredible winner, I thought okay, maybe this is not your day, maybe it’s his day, you’ve got to take it on the chin.